Do you appear tired or stressed - even when you’re feeling fine? Replace a lined, heavy upper face with a subtly rejuvenated appearance. Forget frozen foreheads - we aim for a naturally smooth, soft look. Retain character with soft lines, or opt for a totally smooth look - the choice is yours! 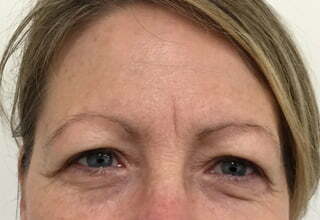 How do frown line injections work? 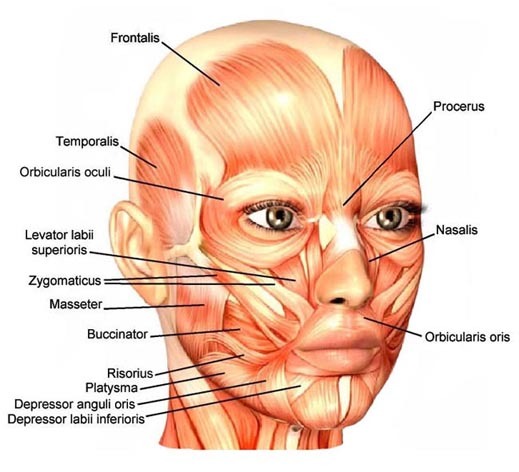 The muscles that control movement across your forehead are called the frontalis and corrugator muscles (see facial muscle diagram, right). These work together to do many things for your face - including lifting your brow by pulling upwards, and furrowing the brow using a downward pulling motion. Through strategic placement of anti-wrinkle injections into the muscles, horizontal lines across the forehead and vertical lines between the eyebrows can be removed or softened. Muscle relaxing injections allow the skin in the effected areas to essentially relax, creating the appearance of fewer lines and wrinkles. What will happen during my stress line injections consult? Your clinician will examine your face and forehead, in particular your facial features, current brow position, brow shape - and any hollowing of temples, eyelid droop or asymmetry. They will discuss your perception of your face and skin, and your desired outcome from the treatment. They will discuss the potential side effects and complications of the treatment, and your post care instructions. You will be provided with an estimate of the number of ‘units’ of the product that are required to create an improvement in your frown lines. If you wish to proceed, the next part of your consultation will take less than 5 minutes. You will have pre-treatment photos taken and your forehead area will be cleaned with alcohol. 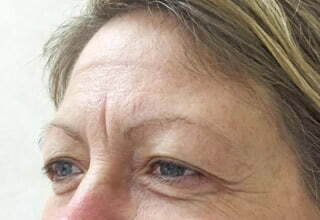 The clinician will ask you to raise your brows and frown while they identify the ideal injection points. The injections themselves take a matter of seconds. If this is your first treatment, a review appointment will be booked in 2 to 3 weeks to assess your results and see if any adjustments need to be made; this won’t be required for subsequent treatments. How much do forehead line injections cost? Estimates are available upon request (click the contact button above or email info@drdavidsharp.com.au). In most cases, frown line injections typically cost between $300 to $380. How long until I see my stress line reduction results? Some patients report seeing results within 2 days, while others can take 7 to 14 days for the full effect to be seen. It’s important to remember that it can take some time before you see results, and often more than one treatment is required to achieve your desired result. No, you can go back to work and normal activities straight after your cosmetic injection. There may be some slight small pimple-like lumps under the injection sites across your forehead, which quickly dissipate after the treatment. 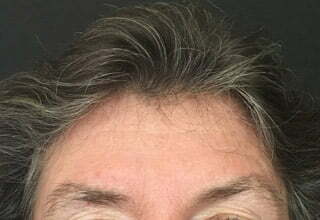 Are there any side effects of frown line injections? 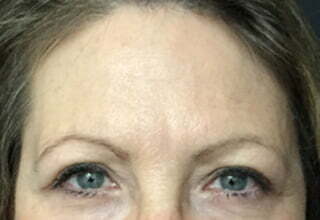 Cosmetic injections to reduce frown lines are very safe. The most common side effect is local bruising around the injection site, and a dull headache, which about 10% of patients experience in the days following treatment. 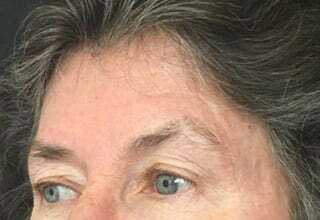 Less common, but possible, side effects can be asymmetry or eyelid droop. If you already have visible facial asymmetry (most people do), sometimes your initial results may take effect at a different pace and each side of the face adjusts to the treatment. This is very normal and usually resolves within a few weeks; it will be assessed at your review visit and if necessary, can be ‘tweaked’ to adjust the amount of product placed and even out any remaining asymmetry. This is one of the factors our clinicians take into account when treating patients. We would always prefer to under-treat initially, and then add more once your initial results are evident, than to over-treat in your first visit and create an over-injected, undesirable appearance simply just to sell a higher volume of product! The longevity of results can vary from patient to patient, but generally most patients have their treatments every 3 to 4 months to maintain their results and prevent further deepening of static (permanent) lines in their brow area. Do stress line injection hurt? How much improvement will I get from forehead wrinkle reduction injections? The extent of improvement in forehead lines depends on what you start with. If your forehead skin is smooth when you are not raising your eyebrows - but has lines when you do raise your brows (these are called dynamic lines as they only appear when you move) - the injections will paralyse the muscles and your forehead will be smooth. However if you have lines in your forehead when you aren’t raising your eyebrows (these are called ‘static’ lines), and they are worse when you raise your brows, the lines will be softened and less visible, but not disappear altogether. For these lines, Dr Sharp recommends working on the skin’s surface and collagen/elastin with Fraxel laser – or Dermapen microneedling to stimulate the skin’s own anti-ageing response and improve skin condition in these areas. It’s important to remember that dynamic lines (that appear when you move) usually form into static lines and wrinkle (which are always there, even when you aren’t moving) over time as the face ages. It’s never too late to reduce static lines, most people always achieve some improvement even with deep established static lines, however preventative action with the subtle use of injectables to reduce dynamic lines can help to prevent static lines from forming. Can I treat only the forehead or do I have to have my entire upper face treated? You can certainly have only the forehead region treated. Because cosmetic injectable rejuvenation works on the dynamics of facial muscles (i.e. the push-and-pull of each muscle working in its own direction to animate the face), injecting one area for a long period of time without considering other areas can cause over-activity in adjacent areas, increasing lines and wrinkles in those regions. Therefore optimal long term results - particularly for people aged over 30 - are obtained when the crow’s feet, and sometimes the brows, are injected at the same time. Subtly treating the entire upper face will optimise the result and reduces the chances of having one area of your upper face over-active, while the other appears inactive, creating an unnatural result. Can dermal fillers also be used in the forehead? Dermal fillers are sometimes used in the upper face region, but typically to replace lost volume in the temporal (temples) area and just inside the eyebrows to restore lost tissue and soften the bony orbital rim around the eyebrows. In some cases where there are extremely deep vertical lines between the brows and evidence of volume loss in this area, a small amount of dermal filler may be applied to plump-out deep wrinkles. When paired together, cosmetic brow tattooing and brow lift/frown line injections are a powerful combination of treatments to achieve visible brow lifting results. Many of our patient choose to have their brows defined and shaped with our brow tattooist, and then lifted with cosmetic wrinkle injections. Not only does this combination frame the face and help to correct asymmetry - but it also gives a more open, youthful appearance to the entire eye area - with the added convenience of saving time each day shaping or applying makeup to the brows to achieve an ideal shape. 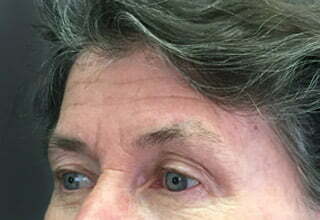 Do I need frown line injections or a blepharoplasty? 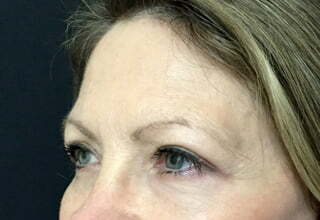 Sometimes, excess eyelid skin can cause you to unconsciously use your forehead muscles to ‘lift’ your eyelid skin. 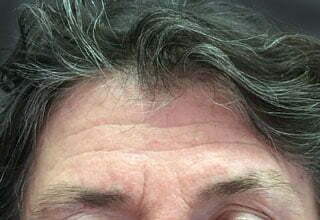 This over-activity of the forehead can lead to premature ageing in this region of the face, causing the creation of deeper horiontal lines. A combination of blepharoplasty surgery and muscle relaxing wrinkle injections can effectively address both the cause, and symptoms, of this. If your eyelid skin obstructs your vision by sitting on your eyelashes while you are looking straight ahead, your blepharoplasty procedure may be deemed medically required, and eligible for a rebate from Medicare and/or your health fund. Call or email us to find out more.